Treatment of acute leukemia is challenging and long-lasting remissions are difficult to induce. Innovative therapy approaches aim to complement standard chemotherapy to improve drug efficacy and decrease toxicity. Promising new therapeutic targets in cancer therapy include voltage-gated Kv1.3 potassium channels, but their role in acute leukemia is unclear. We reported that Kv1.3 channels of lymphocytes are blocked by memantine, which is known as an antagonist of neuronal N-methyl-D-aspartate type glutamate receptors and clinically applied in therapy of advanced Alzheimer disease. Here we evaluated whether pharmacological targeting of Kv1.3 channels by memantine promotes cell death of acute leukemia cells induced by chemotherapeutic cytarabine. We analyzed acute lymphoid (Jurkat, CEM) and myeloid (HL-60, Molm-13, OCI-AML-3) leukemia cell lines and patients’ acute leukemic blasts after treatment with either drug alone or the combination of cytarabine and memantine. Patch-clamp analysis was performed to evaluate inhibition of Kv1.3 channels and membrane depolarization by memantine. Cell death was determined with propidium iodide, Annexin V and SYTOX staining and cytochrome C release assay. Molecular effects of memantine co-treatment on activation of Caspases, AKT, ERK1/2, and JNK signaling were analysed by Western blot. Kv1.3 channel expression in Jurkat cells was downregulated by shRNA. Our study demonstrates that memantine inhibits Kv1.3 channels of acute leukemia cells and in combination with cytarabine potentiates cell death of acute lymphoid and myeloid leukemia cell lines as well as primary leukemic blasts from acute leukemia patients. At molecular level, memantine co-application fosters concurrent inhibition of AKT, S6 and ERK1/2 and reinforces nuclear down-regulation of MYC, a common target of AKT and ERK1/2 signaling. In addition, it augments mitochondrial dysfunction resulting in enhanced cytochrome C release and activation of Caspase-9 and Caspase-3 leading to amplified apoptosis. Our study underlines inhibition of Kv1.3 channels as a therapeutic strategy in acute leukemia and proposes co-treatment with memantine, a licensed and safe drug, as a potential approach to promote cytarabine-based cell death of various subtypes of acute leukemia. Therapy of acute leukemia demands high dose chemotherapy and often stem cell transplantation, which is not feasible in elderly leukemia patients due to severe toxic side effects. For those patients, prognosis remains poor and even palliative treatment options are limited. In addition, older patients show a more heterogeneous clinical biology with induction of aberrant signaling pathways. Therefore, to complement standard chemotherapy and to improve drug efficacy, multi-targeting approaches with potential drug combinations are being investigated [1, 2]. The PI3K-AKT-mTOR and MAPK/ERK1/2 pathways are major signaling cascades deregulated in acute leukemia [3–7] and contribute to an aggressive phenotype and enhanced chemo-resistance. An important target of ERK1/2  and AKT  signaling is the transcription factor MYC, which is involved in cell growth, proliferation and apoptosis . Since MYC is a central oncogene inducing leukemic transformation in T cell acute lymphoid leukemia (T-ALL) and acute myeloid leukemia (AML) [11, 12], influencing AKT, ERK1/2 and MYC signaling may enhance the efficacy of chemotherapy in ALL and AML [13–20]. In search of novel treatment options, voltage-gated Kv1.3 potassium channels have become promising drug targets. Kv1.3 channels localize in the plasma membrane and participate in controlling the membrane potential, proliferation and effector function of lymphocytes . In addition, inactivation of Kv1.3 channels expressed in the inner mitochondrial membrane  induces intrinsic apoptosis of lymphocytes via mitochondrial cytochrome C (CytC) release and production of reactive oxygen species (ROS) [23–25]. Kv1.3 channels on lymphoid and myeloid leukemia cells have been proposed as diagnostic biomarkers [26, 27] and druggable targets for therapy in chronic lymphocytic leukemia [25, 28], lymphoma , and solid cancers [30–34]. However, the role of Kv1.3 channels in acute leukemia is unclear and there are no licensed drugs for specific inhibition of Kv1.3 channels in cancer treatment. Memantine (3,5-Dimethyltricyclo [3.3.1.1] decanamin) is a registered drug known to inhibit N-methyl-D-aspartate type glutamate receptors (NMDARs) in neurons and has been used for many years in the treatment of moderate-to-severe Alzheimer disease [35, 36]. We reported that in lymphocytes memantine blocks Kv1.3 channel activity and diminishes lymphocyte effector function [37, 38]. Furthermore, standard doses of memantine applied in Alzheimer therapy inhibit Kv1.3 channels on patients’ peripheral blood T cells and alter T cell reactivity in vivo . Thus, we asked whether pharmacological inhibition of Kv1.3 channels by memantine could be an option to enhance cell death of acute leukemia cells induced by the chemotherapeutic drug cytarabine (AraC). Analyzing acute lymphoid and myeloid leukemia cell lines and patients’ acute leukemic blasts, our data highlight the importance of Kv1.3 channels for the survival of acute leukemia cells and provide initial evidence that memantine and cytarabine co-treatment may be a potential therapeutic strategy to enhance the efficacy in acute leukemia treatment. Jurkat (JE6–1), F9, JMR , A3, C8 (I.9.2) , CEM, HL-60, Molm-13, OCI-AML-3 cells, primary cells from healthy donors, and primary leukemic cells were cultured in RPMI 1640 medium (Biochrom AG, Berlin, Germany) supplemented with 10% fetal calf serum. JE6–1 and CEM cells were bought from ATCC and AML cell lines from DSMZ or ATCC. Cell lines were tested for mycoplasma with PCR or Mycoplasma Detection Kit from Lonza (Basle, Switzerland). Peripheral blood was obtained from healthy donors and a newly diagnosed T-ALL patient, and bone marrow (BM) samples of AML patients were obtained from the Tumor Bank of the Medical Faculty Magdeburg. Peripheral blood mononuclear cells (PBMC) were isolated with Biocoll (Biochrom AG) and CD3+ T cells with Pan-T-Cell-Isolation Kit-2 (Miltenyi, Bergisch-Gladbach, Germany). In each experiment, cell lines or primary cells were cultured without drug, with memantine (Tocris Biosciences, Bristol, Great Britain), AraC (Department of Pharmacy, Medical Faculty Magdeburg), and a combination of memantine plus AraC. AraC concentrations were titrated for each ALL and AML cell line to cover 10–90% cell death. Cell death (with gating on all cells or specific subpopulations when indicated) was determined with SYTOX-Pacific Blue™ (Molecular Probes, Thermo Fisher Scientific, Darmstadt, Germany) ± Annexin V-FITC (BD Pharmingen, Heidelberg, Germany), propidium iodide (PI) (Sigma-Aldrich, St. Louis, USA) or LIVE/DEAD™ Fixable Aqua Dead Cell Stain Kit (Invitrogen, Thermo Fisher Scientific). Percentage of T-ALL cells in sub-G0/1-phase of cell cycle was determined with PI. Kv1.3 surface expression was analysed with Kv1.3-FITC antibodies (Alomone, Jerusalem, Israel; Sigma-Aldrich) using IgG isotype-FITC (BD Pharmingen) or unstained cells as controls. CEM and AML cell lines were incubated with human FcR block (Miltenyi) before staining with Kv1.3 antibodies. BM samples from AML patients were thawed and cultured for 3 or 24 h. Cells were stained with LIVE/DEAD Aqua Blue to discriminate live cells, incubated with human FcR block and then labeled with CD117 (104D2, BioLegend) and Kv1.3 antibodies. Kv1.3 expression is shown for viable CD117+ leukemic blasts. Flow cytometry was performed with a FACSFortessa™ (BD Bioscience, Mountain View, USA). Intracellular ATP content, as a measure of viable cells, was determined with CellTiter-Glo® Luminescent Cell Viability Assay (Promega, Mannheim, Germany) according to the manufacturer’s protocol. Mitochondrial CytC release was determined as described . In brief, plasma membranes of cultured cells were permeabilized with the mild detergent saponin. Cells were washed to remove cytosolic CytC released from mitochondria during apoptosis. Then the outer mitochondrial membrane was permeabilized with digitonin (50 μg/ml) in 50 μM EDTA, 100 mM KCl for 5 min on ice. Cells were fixed in 4% paraformaldehyde for 20 min, washed and incubated for 1 h in blocking buffer (3% BSA, 0.05% saponin in PBS). Cells were incubated overnight with CytC-AlexaFluor 488 monoclonal antibodies (6H2.B4, BD Pharmingen) and analyzed by flow cytometry. Cells having released mitochondrial CytC, i.e. apoptotic cells, had a lower fluorescence signal. DNA synthesis was determined in triplicates by 3[H]-Thymidine incorporation (0.2 μCi/ well, MP Biomedicals, Heidelberg, Germany) at day 3 for 16 h.
Patch-clamp experiments were performed as described . Kv1.3 currents were measured every 30 s with depolarizing voltage steps up to + 60 mV from a holding potential of − 80 mV. Sampling rate was 50 kHz during the measurement of Kv1.3 currents. Number of Kv1.3 channels per cell was determined by dividing the whole-cell Kv1.3 conductance by the single-channel conductance value (Kv1.3:12 pS) [43, 44]. For membrane potential experiments, JE6–1 cells were recorded in the current clamp mode with zero pA holding current immediately after establishment of the whole-cell configuration. Memantine was kept in a constant concentration during recording in the fixed holding potential (− 80 mV) and the amplitude of the current was measured to determine membrane depolarization. KCl treatment served as a positive control for cell integrity. Cells were cultured without drug, with memantine, AraC (60 nM for Jurkat, 250 nM for Molm-13), and memantine plus AraC. Cytoplasmic and nuclear protein extracts were prepared as described . Antibodies used in Western blots were: p-AKT(S473), AKT, pS6(S240/244), p-ERK1/2(T202/Y204), ERK1/2, pJNK1/2(Thr183/Tyr185), c-JUN (60A8), human Caspase-9, active Caspase-3 (5A1E, only detects cleaved active Caspase-3), Caspase-8 (all Cell Signaling, Leiden, The Netherlands), c-MYC (9E10, BD Pharmingen), β-Actin (AC-74, Sigma-Aldrich), Lamin B (sc-6217, Santa Cruz Biotechnology Europe). Primary antibodies were detected with species-specific secondary antibodies (Dianova, Hamburg, Germany) and chemiluminescence. Nitrocellulose membranes were reprobed for several proteins. Lentiviral transduction was performed as described . Lentivirus was generated in 293 T cells by transfection of pLKO.1-Kv1.3 shRNA or pLKO.1-scrambled (scr) shRNA (Sigma-Aldrich). JE6–1 cells were infected twice with lentivirus. Puromycin was kept at 0.25 μM for 4 days. RNA was extracted at day 3–4 post infection using Trizol® (Invitrogen, Thermo Fisher Scientific) and reverse transcribed (Quiagen, Düsseldorf, Germany). Knockdown was confirmed by PCR: forward Kv1.3: 5′-GGT CAT CAA CAT CTC CGG CGT GCG CT-3′ and reverse Kv1.3: 5′-AGG GCC GCT CCT CCT CCC GC-3′ (Apara Bioscience, Denzlingen, Germany), SYBR Green II (Thermo Fisher Scientific) and the CFX96 Real-Time System (BIO-RAD, Munich, Germany). Statistics were performed with Cell Quest Pro software (BD Bioscience), HEKA FitMaster v2x53 and IgorPro for patch-clamp transient currents and GraphPad Prism for analysis of dose-response curves and Student’s t-test, with P* < 0.05, P** < 0.01, and P*** < 0.001. The combination index (CI) and dose reduction index (DRI) were determined with CompuSyn1.0 software using the Chou-Talalay method . For primary AML cells, the coefficient of drug interaction (CDI) was calculated to assess the synergistic inhibitory effect of the drug combination (CDI = AB/(A × B)) . Kv1.3 channels play a key role in setting the resting potential, proliferation and apoptosis of T cells and are expressed in healthy human T cells and the T-lymphoblastic leukemia cell line Jurkat [21, 48, 49] (Additional file 1: Figure S1a). 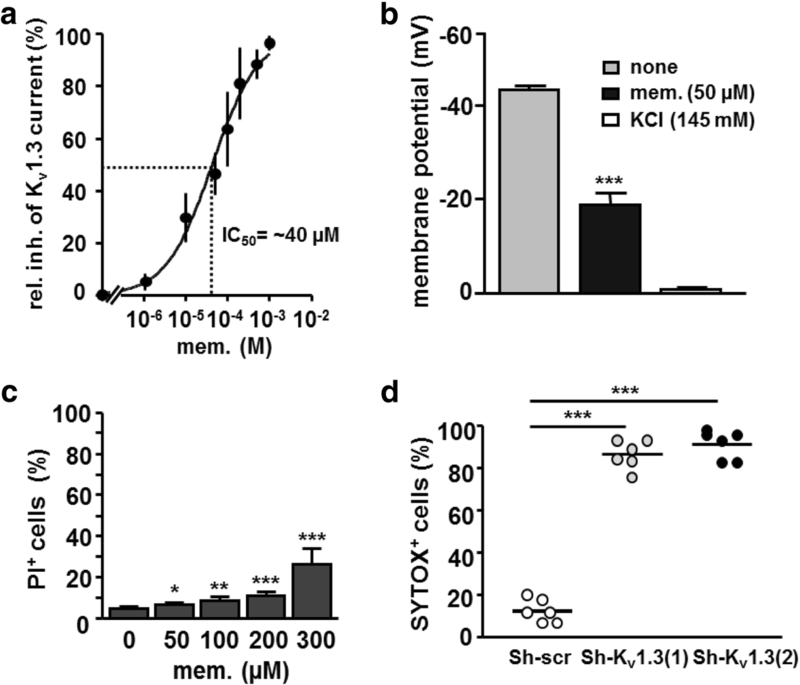 Given that specific Kv1.3 channel blockers for clinical therapy are not licensed, we used memantine, an approved drug shown to block Kv1.3 channels in vivo , and analyzed its effect on Jurkat cells. In voltage-clamp recordings, memantine blocked Kv1.3 channel currents of Jurkat cells in a dose-dependent manner with an IC50 value of ~ 40 μM (Fig. 1a). Memantine depolarized the membrane potential (Fig. 1b) and induced substantial cell death of Jurkat cells at concentrations above 200 μM (Fig. 1c). To support a role of Kv1.3 channels in survival of acute leukemia cells, we knocked down Kv1.3 channels in Jurkat cells. Lentiviral transduction of Jurkat cells resulted in a 40–50% reduction of Kv1.3 mRNA (Additional file 1: Figure S1b). Partial knockdown of Kv1.3 mRNA in Jurkat cells by both shRNAs (1 and 2) resulted in pronounced cell death in comparison to cells treated with nonspecific shRNA (Sh-scr) (Fig. 1d). 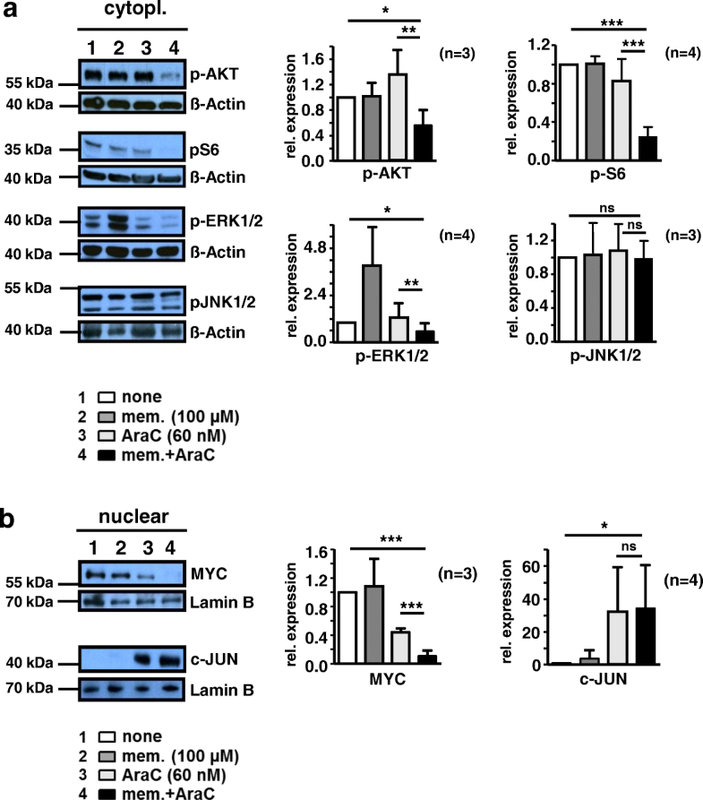 Taken together, pharmacological inhibition using memantine or genetic inactivation of Kv1.3 channels impairs survival of Jurkat acute lymphoblastic leukemia cells. To evaluate whether pharmacological inhibition of Kv1.3 channels on acute leukemia cells could be a valuable approach to enhance chemotherapeutic efficacy, we assessed the effect of Kv1.3 channel blockade by memantine in combination with AraC (one of the frontline chemotherapeutic drugs in acute myeloid leukemia treatment). Memantine increased AraC-induced cell death of Jurkat cells in a dose-dependent manner (Fig. 2a). For evaluation of the nature of drug interaction, we used fixed drug ratio design and the Chou-Talalay method . Combination index (CI) values < 1, =1, > 1 indicate synergistic, additive and antagonistic effects. CI values for memantine ranged from 0.99 at the affected fraction (Fa) of 0.25 to 0.44 at Fa 0.97 (97% dead cells) indicating varied effects ranging from additive to synergistic (Fig. 2b). The dose reduction index (DRI) at the Fa of 0.97 was 2.4 (Fig. 2b), i.e. memantine co-treatment allows a 2.4-fold dose reduction of AraC to kill 97% of cells. To complement this data, Jurkat cells with Kv1.3 channel knockdown were simultaneously treated with AraC. Genetic inactivation of Kv1.3 channels induced 70–80% cell death (on day 5). Interestingly, addition of AraC (20 nM) further augmented cell death to 95% (Fig. 2c), supporting a cooperative action of AraC and Kv1.3 channel inhibition in inducing cell death. AraC/memantine co-treatment of Jurkat cells also induced a decline in intracellular ATP level and DNA synthesis compared to cells treated with AraC alone (Fig. 2d and e). To exclude the possibility of a Jurkat cell-specific effect, we analysed AraC-induced cell death of the human acute lymphoblastic leukemia cell line CEM. As in Jurkat cells, Kv current in CEM cells is exclusively mediated by Kv1.3 channels . Again, AraC/memantine co-treatment enhanced cell death of CEM cells compared to cells treated with AraC alone (Fig. 2f). Further, we examined the effect of memantine co-treatment on primary ALL blasts. PBMC from a newly diagnosed T-ALL patient responded to memantine co-treatment with a 2–3-fold increase in the percentage of cells in sub-G0/1-phase of cell cycle, representing dead cells, compared to AraC application alone (Fig. 2g). In contrast, memantine co-treatment of peripheral blood T cells of healthy donors increased cell death in combination with AraC only at concentrations beyond 100 μM (Fig. 2h), indicating that primary human T cells are less sensitive to memantine co-treatment than acute leukemic T cells. Hence, pharmacological inhibition of Kv1.3 channels by memantine potentiates AraC-induced proliferative arrest and cell death in acute lymphoid leukemia cells. Hyper-activation of signaling cascades, including AKT and ERK1/2, promotes the development of leukemia. Therefore, simultaneous targeting of these signaling cascades might enhance chemotherapeutic efficacy [51, 52]. To delineate molecular events affected by memantine, AraC alone or in combination, we analyzed the activation of AKT, ribosomal component S6, ERK1/2, and JNK1/2 in Jurkat cells. We also monitored nuclear accumulation of MYC, a target of ERK1/2 and AKT signaling (Fig. 3). While co-application of memantine and AraC reduced the level of p-AKT and p-S6 to 42 and 27% of untreated controls, respectively, AraC treatment had no major effect. Memantine treatment alone enhanced the expression of p-ERK1/2, however, concomitant drug treatment reduced p-ERK1/2 by 54% compared to AraC monotherapy. Neither AraC nor AraC/memantine treatment significantly altered the expression of p-JNK1/2 (Fig. 3a), indicating a selective inhibition of signaling molecules by AraC and AraC/memantine. Furthermore, AraC treatment resulted in decreased nuclear MYC and this effect was even stronger upon memantine co-treatment (a further 4-fold decrease) (Fig. 3b). In contrast, AraC and AraC/memantine co-treatment showed a similar nuclear accumulation of the transcription factor JUN, suggesting that JUN induced by AraC is not significantly affected by memantine (Fig. 3b). Thus, in combination with AraC, memantine fosters inhibition of AKT, ERK1/2 and MYC signaling in Jurkat cells, key regulators of proliferation and survival in acute leukemia. Since memantine potentiated AraC-induced cell death, we investigated distinct apoptosis mechanisms. Analyzing the extrinsic apoptotic pathway, Caspase-8 levels in AraC- and AraC/memantine-treated Jurkat cells were similar (Additional file 1: Figure S2a) consistent with a previous report on AraC-induced apoptosis . In addition, in Caspase-8-deficient (C8) and parental (A3) Jurkat cells memantine co-treatment led to a similar enhancement of AraC-induced cell death (Additional file 1: Figure S2b), indicating that the effects of memantine are independent of Caspase-8 activity. We next studied whether memantine acts on the intrinsic apoptotic pathway. Memantine co-treatment augmented the percentage of CytClow Jurkat cells, representing apoptotic cells having released mitochondrial CytC, by 10–40% (Fig. 4a). Furthermore, expression of Caspase-9 fragments, which are indicative of active Caspase-9 induced by mitochondrial CytC release, was elevated in Jurkat cells upon co-treatment in comparison to AraC monotherapy (Fig. 4b). Combined drug treatment also resulted in a 4-fold increase in the expression of the cleaved active form of Caspase-3 (Fig. 4b). The important contribution of Caspase-9 activation for cell death potentiated by memantine was supported by analysis of Caspase-9-deficient (JMR) and Caspase 9-reconstituted (F9) cells. Memantine significantly enhanced AraC-induced cell death in F9, but not in JMR cells, which were less sensitive to AraC treatment than F9 cells (Fig. 4c). 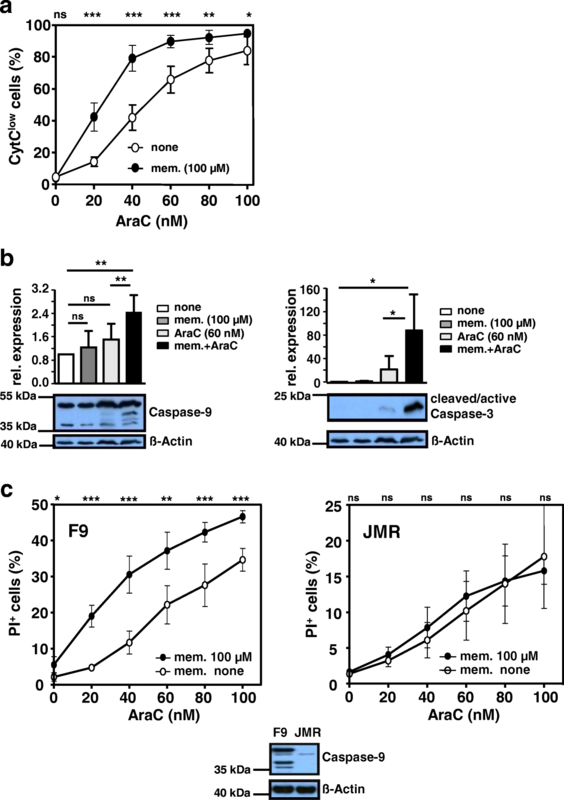 Overall, the results allow the conclusion that memantine enhances AraC-induced cell death by promoting CytC release and activation of Caspase-9 and Caspase-3, thus amplifying intrinsic apoptosis. Since in adults acute leukemia mainly comprises myeloid differentiation, we asked whether AraC/memantine co-treatment could be an option in therapy of AML. Therefore, we analyzed the human myeloid leukemia cell lines HL-60, Molm-13 and OCI-AML-3. Surface expression of Kv1.3 channels on these AML cell lines was verified by flow cytometry (Additional file 1: Figure S3a) . Patch-clamp studies confirmed their functionality and the average expression number could be calculated to 505, 431 and 464 Kv1.3 channels per cell for HL-60, Molm-13 and OCI-AML-3, respectively (Additional file 1: Figure S3b). 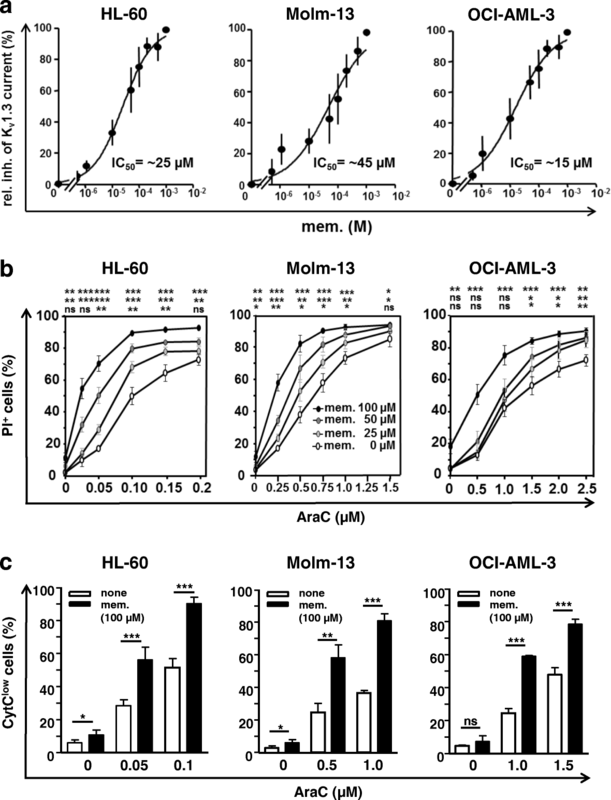 Memantine blocked Kv1.3 channel activity with IC50 values of 25, 45 and 15 μM for HL-60, Molm-13 and OCI-AML-3 cells (Fig. 5a). In combination with AraC, 25–100 μM memantine further enhanced AraC-induced cell death in the AML cell lines investigated (Fig. 5b). CI values calculated from constant drug ratio experiments showed synergistic effects with CI values at Fa 0.97 of 0.46, 0.76 and 0.71 for HL-60, Molm-13 and OCI-AML-3 cells, respectively, and DRI values at Fa 0.97 of 7.7, 1.8 and 5.4 (Additional file 1: Figure S3c). Co-application of memantine also significantly raised the percentage of CytClow cells in each AraC-treated AML cell line (Fig. 5c), indicating enhanced mitochondrial dysfunction. Immunoblotting of Molm-13 cells revealed that combined AraC/memantine treatment enhances the decline of p-AKT and p-ERK1/2 compared to AraC application alone (Additional file 1: Figure S3d). Altogether, these results suggest that memantine potentiates AraC cytotoxicity through similar mechanisms in acute lymphoid and myeloid leukemia cell lines. To validate memantine’s therapeutic potential in AML, we analyzed leukemic blasts from bone marrow of 10 AML patients (Additional file 1: Table S1). Low surface expression of Kv1.3 was detectable on all analysed viable CD117+ AML blasts (Fig. 6a). Although sensitivity of AML cells towards AraC and memantine varied between individuals, co-treatment with memantine (100 and 50 μM) further increased cell death of AraC-treated AML samples (Fig. 6b and c). Nature of memantine and AraC interaction was evaluated by calculating coefficient of drug interaction (CDI) values. Interestingly, CDI values were less than one indicating synergism when the cells were simultaneously treated with memantine and AraC. Compared to cell lines, patients’ primary leukemic cells were more sensitive to memantine monotherapy as it induced pronounced cell death in the absence of AraC. The results from primary acute leukemic blasts suggest that combined AraC/memantine treatment could be a therapeutic strategy to enhance cell death in acute leukemia. In line with reports underscoring the importance of Kv1.3 channels in survival of leukemic B cells [28, 55] and various cancer cell lines , our data provide initial evidence that Kv1.3 channels are druggable targets in chemotherapy of T-ALL and AML. To address the clinical need for a pharmacological Kv1.3 channel inhibitor, we used memantine, which shows an excellent safety profile and is licensed for NMDAR antagonism in advanced Alzheimer disease . Memantine inhibited Kv1.3 channels and potentiated AraC-induced cell death of acute lymphoid (Jurkat, CEM) and myeloid (HL-60, Molm-13, OCI-AML-3) leukemia cell lines (representing highly chemoresistant aggressive clones) as well as primary acute leukemic blasts. Synergistic drug effects were observed for the analyzed cell lines and AML blasts. Jurkat and Molm-13 cells showed enhanced reduction of ERK1/2 and AKT signaling upon drug co-treatment and enhanced cell death of Jurkat and AML cell lines was connected with increased CytC release. Since mitochondrial Kv1.3 channels contribute to the intrinsic apoptotic pathway upon a pre-existing apoptotic stimulus [23, 25], AraC may act as a sensitizer for inhibition of Kv1.3 channels. Thus, addition of memantine to AraC results in enhanced CytC release and activation of Caspase-9 and Caspase-3. In primary ALL and AML blasts memantine monotherapy already induced cell death, but combination of memantine and AraC was most effective in cell death induction of leukemic blasts. In contrast to acute leukemic cells, primary non-malignant T lymphocytes did not show a relevant potentiation of AraC by memantine. This may relate to the enhanced susceptibility of malignant cells to reactive oxygen species produced at the mitochondria upon apoptosis induction [23, 25]. Using murine lymphocytes, we previously reported that memantine blocks Kv1.3 and KCa3.1 channels . Therefore, we do not exclude a possibility of memantine affecting KCa3.1 channels (and maybe other ion channels) [50, 54, 56, 57] which might contribute to memantine’s potentiation of AraC cytotoxicity. Compared to memantine treatment alone, knockdown of Kv1.3 mRNA in Jurkat cells was more effective in inducing cell death. This could in part be due to transient pharmacological blockade of cell surface Kv1.3 channels by memantine and a compensatory up-regulation of Kv1.3 channel expression and activity as a mechanism of drug resistance [39, 54]. The PI3K-AKT-mTOR and ERK1/2 signaling pathways are commonly activated in acute leukemia and confer poor prognosis . PI3K-AKT-mTOR inhibitors have been used in clinical trials [13, 58], however, the induction of feedback and compensatory mechanisms, like aberrant ERK1/2 activation leading to phosphorylation of ribosomal protein S6, may have contributed to drug resistance . Further, treatment of T-ALL cell lines with PI3K and mTOR inhibitors led to an up-regulation of MYC [59, 60]. Here we found that memantine co-treatment targets several central signaling cascades as it concurrently decreased AKT, ERK1/2 and MYC signaling while increasing mitochondrial CytC release and Caspase-9/Caspase-3 activation. Since memantine/AraC co-treatment led to effective killing of lymphoid and myeloid leukemia cell lines and patients’ leukemic blasts with different genetic background, memantine may act through ‘common’ mechanisms that feed into or extend the AraC-induced cell death machinery. Beside inhibition of AKT-mTOR and ERK1/2 signaling, these may include inhibition of calcium signaling and cell cycle by altering the membrane potential  and increase of intracellular potassium concentrations, which inhibited AKT-mTOR activity in T-effector cells by unknown mechanisms . Memantine is an orally given drug with excellent bioavailability and long half-life. Steady-state memantine concentrations in serum of treated (10–20 mg/day) Alzheimer patients were reported to be < 1.0 μM [35, 36]. In our study, effective memantine concentrations (given only once at begin of cell culture) ranged from 25 to 100 μM. However, daily therapeutic doses of memantine block Kv1.3 channels on blood T cells and inhibit T cell function in vivo, whereas inhibition of human T cell function in vitro required higher memantine concentrations . Various pharmacologic factors such as drug metabolites, half-life, daily dosing, and niche specific drug-cell interactions might account for the difference of in vitro versus in vivo drug effectiveness. Memantine is being tested in several disease settings without showing severe side effects even in elderly patients and at higher drug doses. As a licensed drug proven to inhibit Kv1.3 channels in vivo, memantine seems to be suited for testing a potential cooperative action in AraC therapy of acute leukemia. Our data support the concept of targeting Kv1.3 channels in ALL and AML therapy and, though in vivo studies remain to be performed, suggest memantine as a potential intensifier of AraC-based treatments of different subtypes of acute leukemia, particular in palliative low-dose AraC monotherapy of patients. The authors like to thank M. Heine, J. Lindquist, V. Reddycherla, and L. Simeoni for discussion, JE6-1 cells and antibodies. This work was supported by grants from the Deutsche Forschungsgemeinschaft (DFG) (SFB854–1/2 to F.H.H. and T.F. (A20), I.S. (A23N), U.S. (A24N), B.S. (B19), U.B. (B9)) and the German Jose-Carreras Leukemia Foundation (DJCLF SP12/08 to F.H.H. and T.F.). T.L. was supported by a stipend from the Medical Faculty of the Otto-von-Guericke-University Magdeburg. T.L., F.H.H., and U.B. designed the study; T.L., T.B., T.S., S.C.N., C.C., and U.B. performed experiments. T.L., T.B., F.H.H., T.F., S.C.N., C.C., and U.B. analyzed data and prepared figures. T.F., F.H.H., I.S., B.S., and U.S. provided patient cells, cell lines, reagents, discussion and scientific advice. T.L., F.H.H., U.S., T.B., S.C.N., and U.B. wrote and revised the manuscript. All authors approved the final manuscript. The study was approved by the Institutional Review Board and Ethics Committee (MD 115/08, MD 40/13) of the Medical Faculty of the Otto-von-Guericke-University Magdeburg, Germany. Patient material for research purposes was obtained after informed and written consent of all donors and according to the Helsinki Declaration.